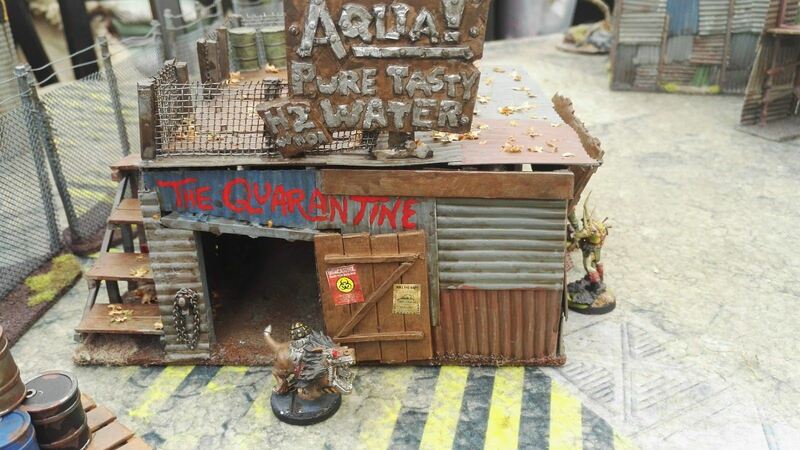 I got the idea for this build after getting a couple of resin signs from Ramshackle Games. Boxed around my mind for a few days and then I drew up the build. Haven't tried doing that before - but I didn't want to mess it up. Here's the concept sketch. 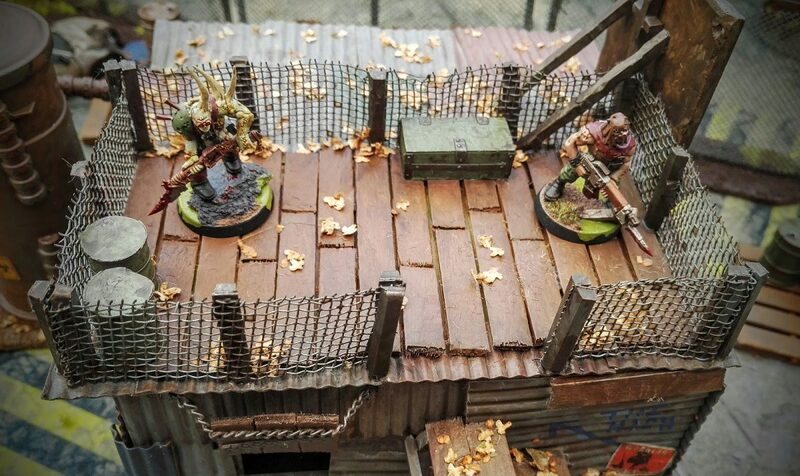 A neat center piece for the post-apoc collection of terrain. 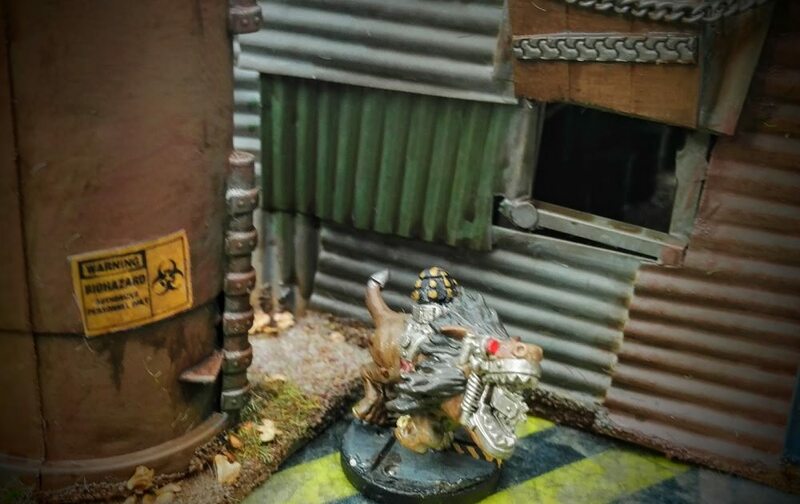 This build is for Ash Wastes in Necromunda, Deadzone, Killteam, This is not a Test, Scrappers and all the other sci-fi / post-apoc games I collect. Jump directly to the showcase. 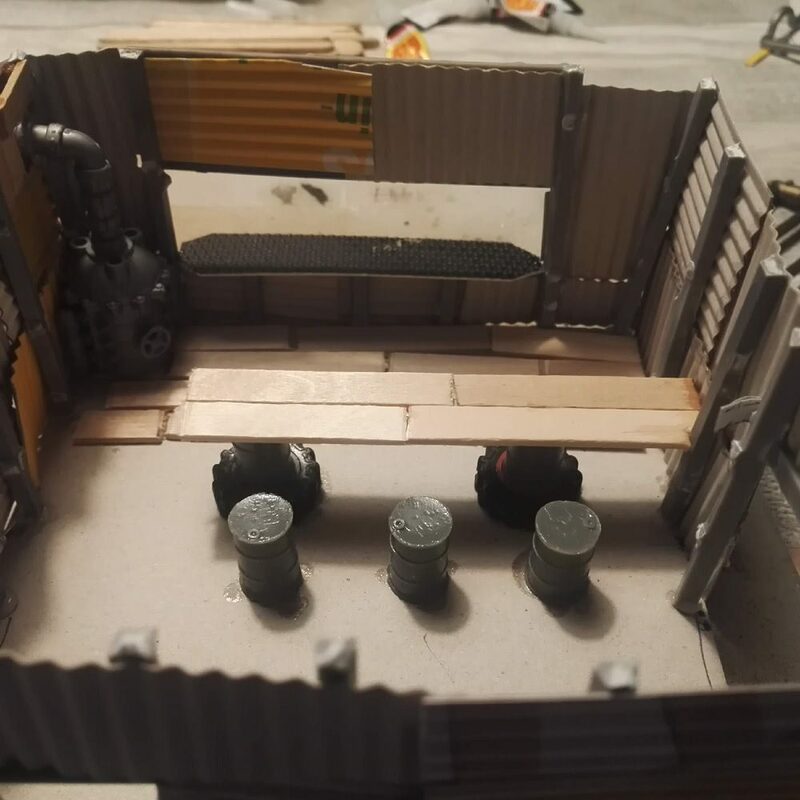 Cut out a base for the build. 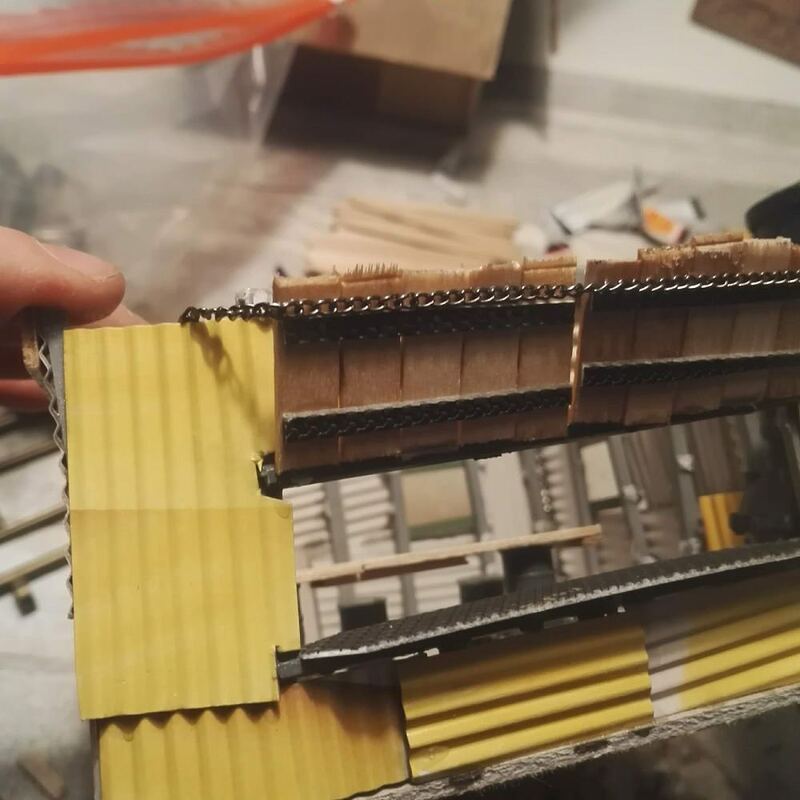 I''ve used 3mm thick cardboard and made it fit my concept scetch. 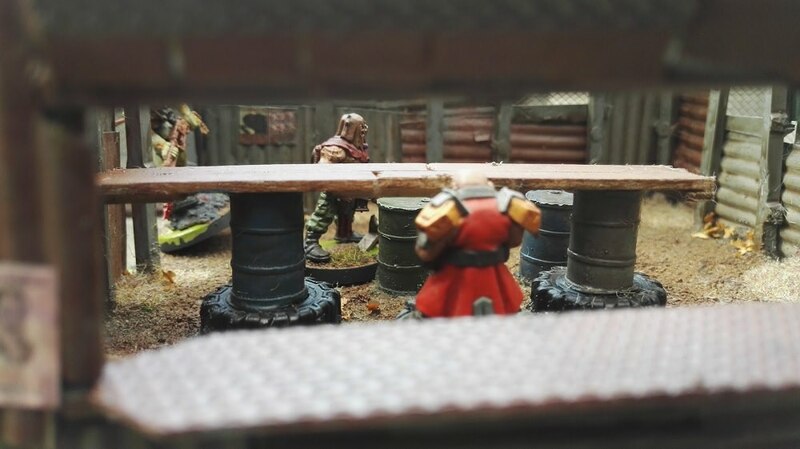 As I play Deadzone, it's as always fitted with the 3" system. Cut up a bunch of old sprue in 3" pieces. Use the hot glue gun to fix it to the base. When dry, mark out windows, a bar and doors with other sprue pieces. 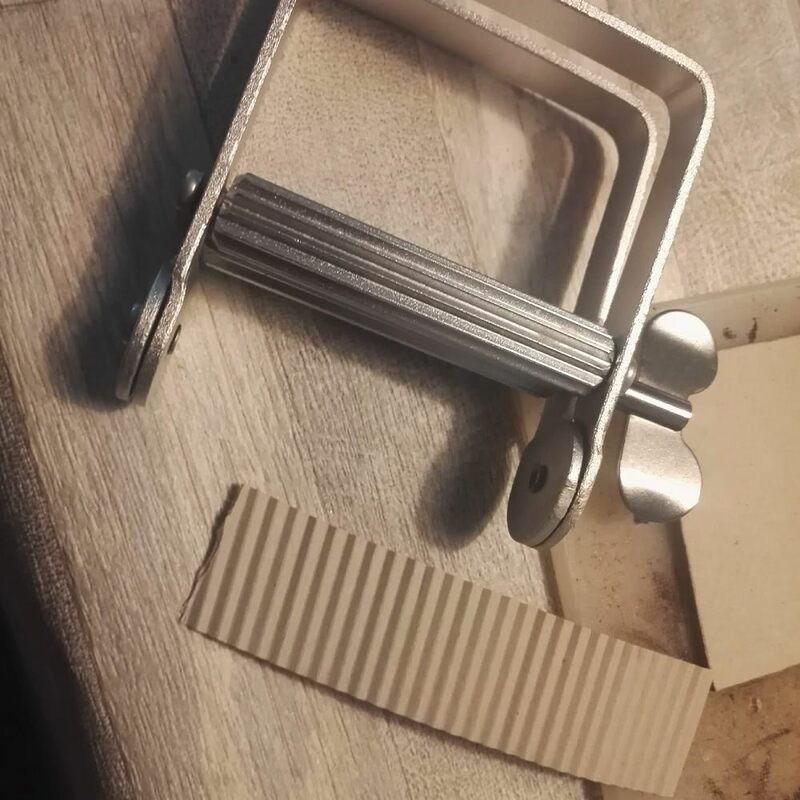 Take your trusted toothpaste squeezer (5$ off eBay incl shipping) and make a load of corrugated metal. Use cardboard, aluminium foil, plastic card or whatever you like. (Tower build with only metal. Walls build with a mix). 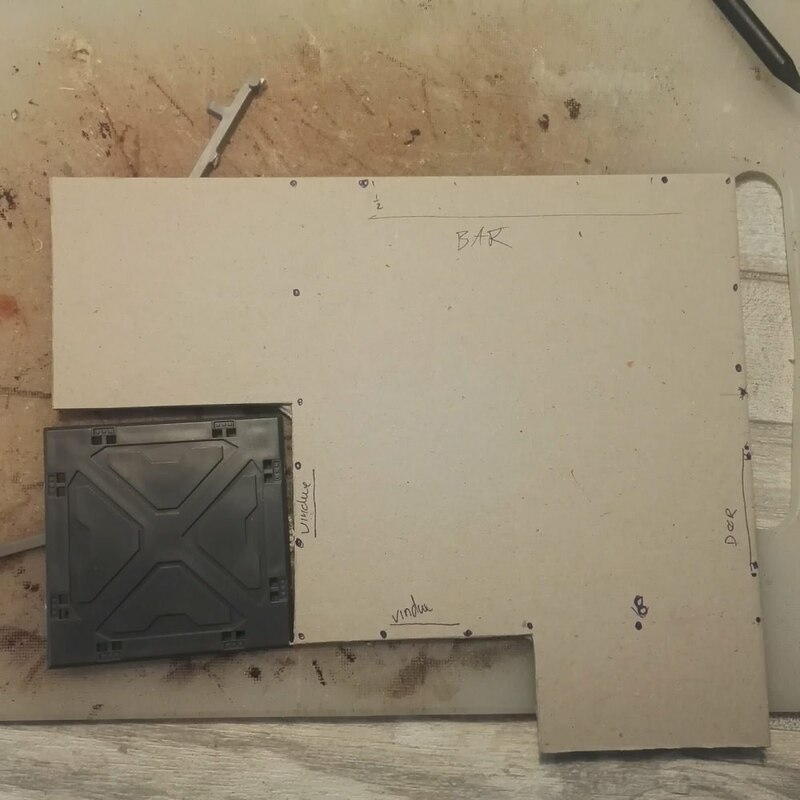 Starting from the bottom and using super glue, attach plates to the walls. The more scaffolding you did, they easier this is. Mix between horizontal and vertical lines, for easy detailing. The water tank is made from a tractor toy, bought for nothing in a thrift store. The piping is from russian Tehnolog. Very cheap kits (and cheap plastic) - got my bits in a trade. Otherwise use plastic tubing (like the pole from small birthday flags). 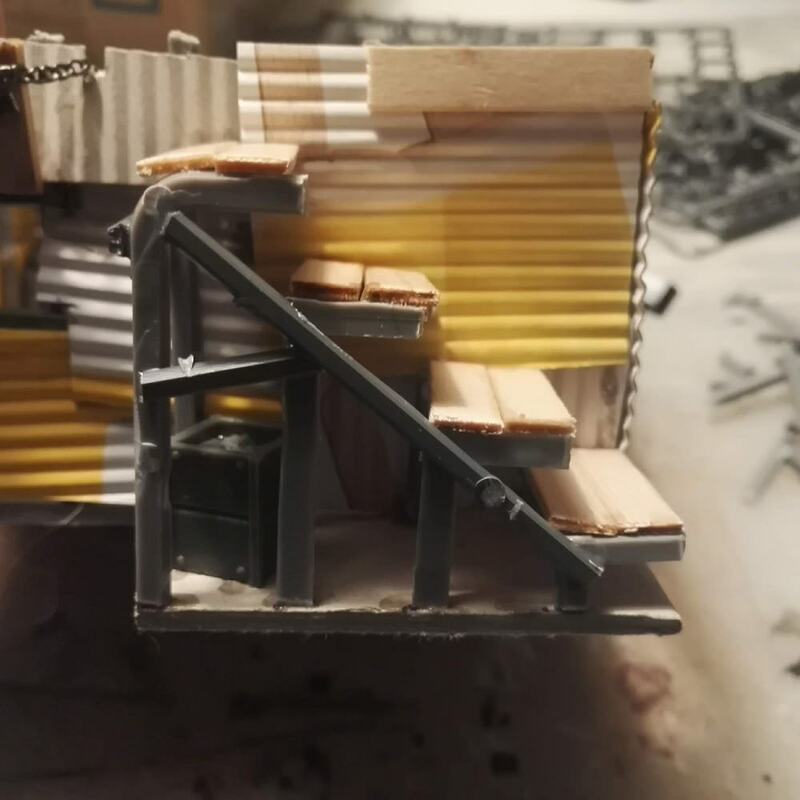 The insde bar is made from some Ramshackle Games oil drums (these were 10pcs for 1£ including shipping during Black Friday), tractor wheels (that toy from before) and ice cream sticks. The bar desk on the wall is from a small pieces of textured plastic (from a box of chocolates). 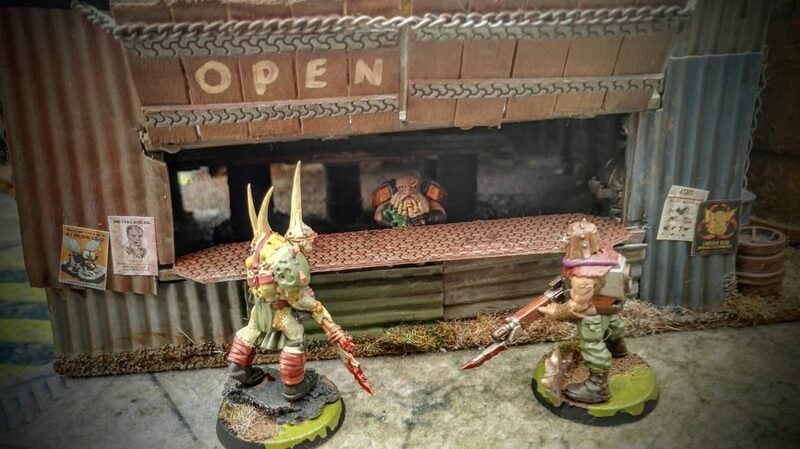 This is a wasteland bar - sand storms, ash storms, raiders. I wanted detail to make it look secure-ish. 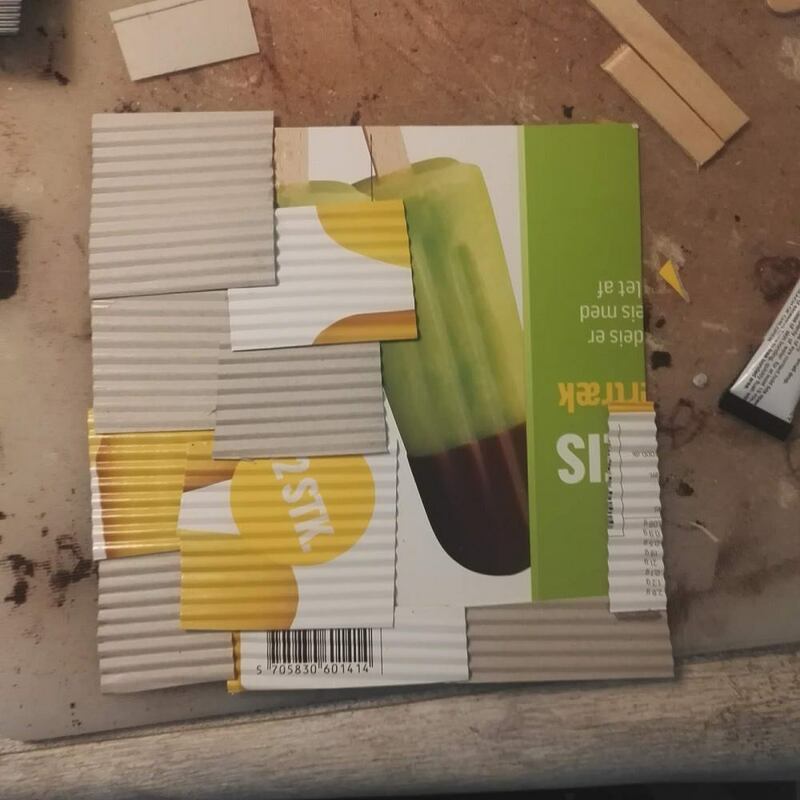 Cut some ice cream sticks into the right size and connect them with a piece of card (this will be hidden). On the front connect them with some texture plastic (the chocolate tray from before) to make metal bars. Attach the windows with some chain. Jump down to the thrift store and buy some old necklaces, it's a lot cheaper than real 'hobby chain'. 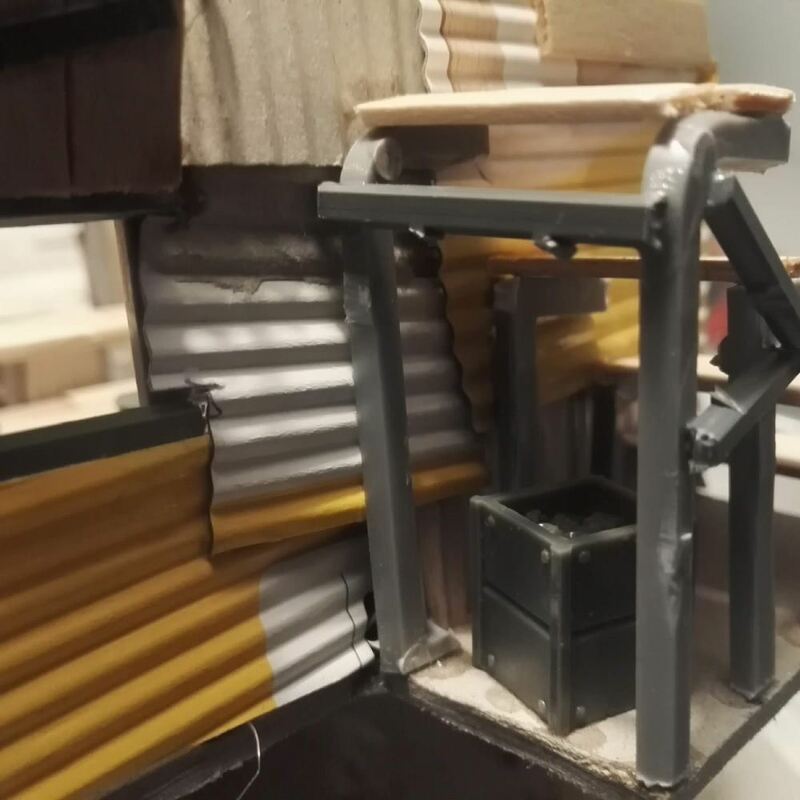 The chain is glued to the shutters with super glue. Then glue it inside the bar (cut a little groove in the wall top, not photoed). Super glue the chain as well making it hard. This will prevent the shutters from breaking off easy (if you've put them in an angle like me). Where possible, I like stairs better than ladders. Giving more placement options for the models. 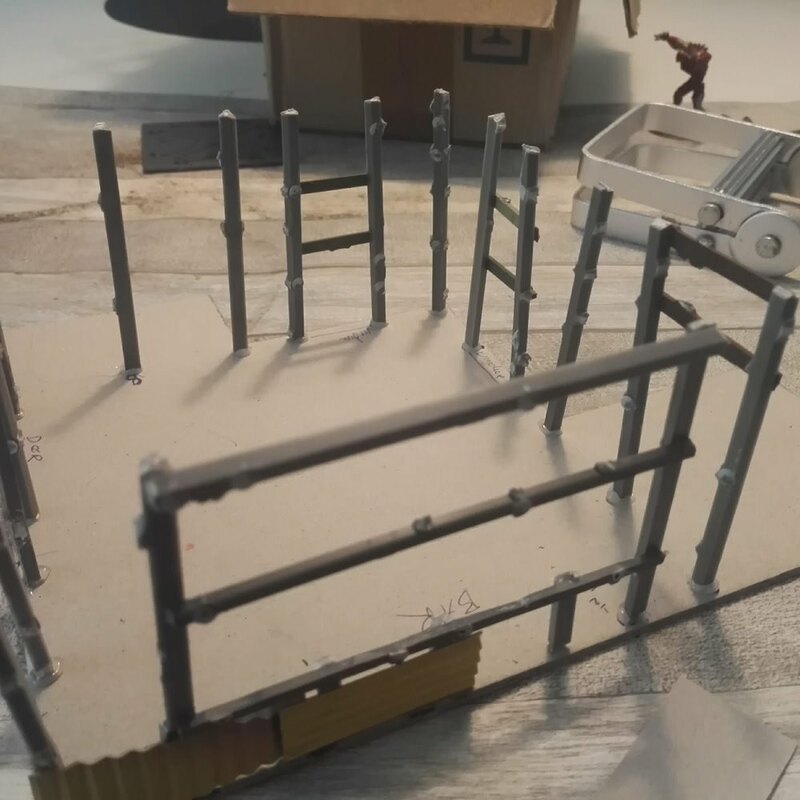 Using sprue, find some pieces that has a natural 90 degree bend. I used superglue to glue the first ones to the walls. 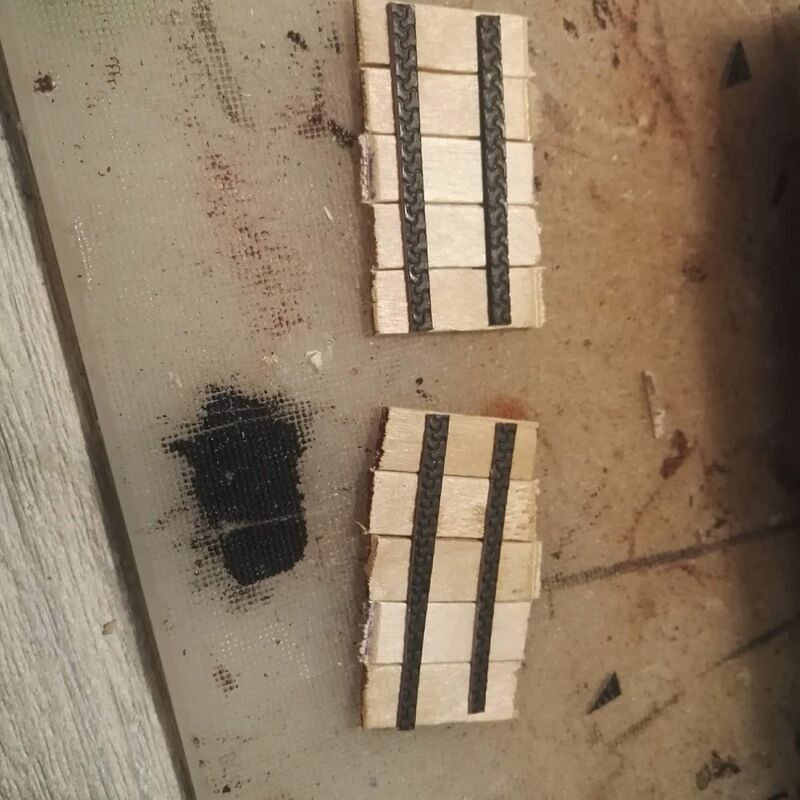 The I placed the outer ones and connected with some ice cream sticks. Added a few extra pieces of sprue for strength. 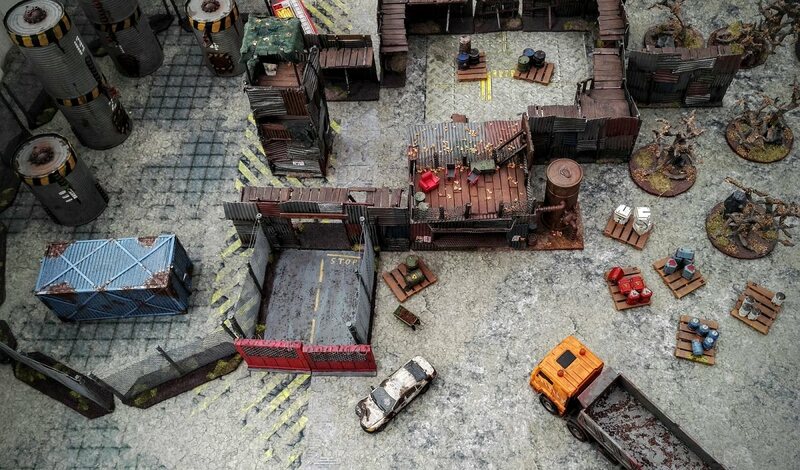 The crate is also from the crazy Ramshackle Games deal. I cut a square of (just over) 6" x 6". Wanting it to go other the walls. It'll the kept stable by all the scaffolding underneath. 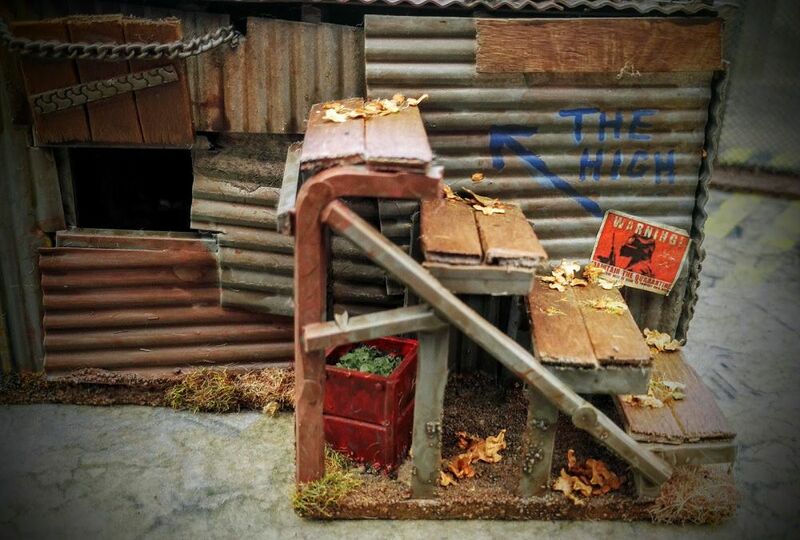 I covered one half with corrugated sheets and the other with sticks. On the terrace, I've marked the middle with a non-cut stick (for Deadzone reference). Using some left over wire mesh (from my chain-link fence) I've made a fence. Cut one long piece and bend it into the right rectangular shape. 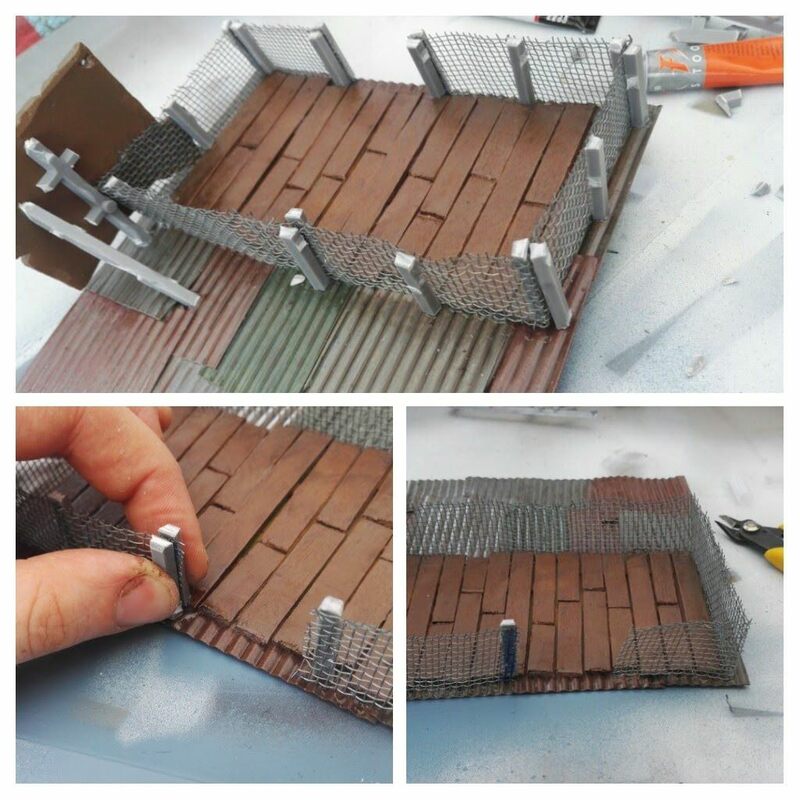 Using sprue and super glue secure the mesh in place. 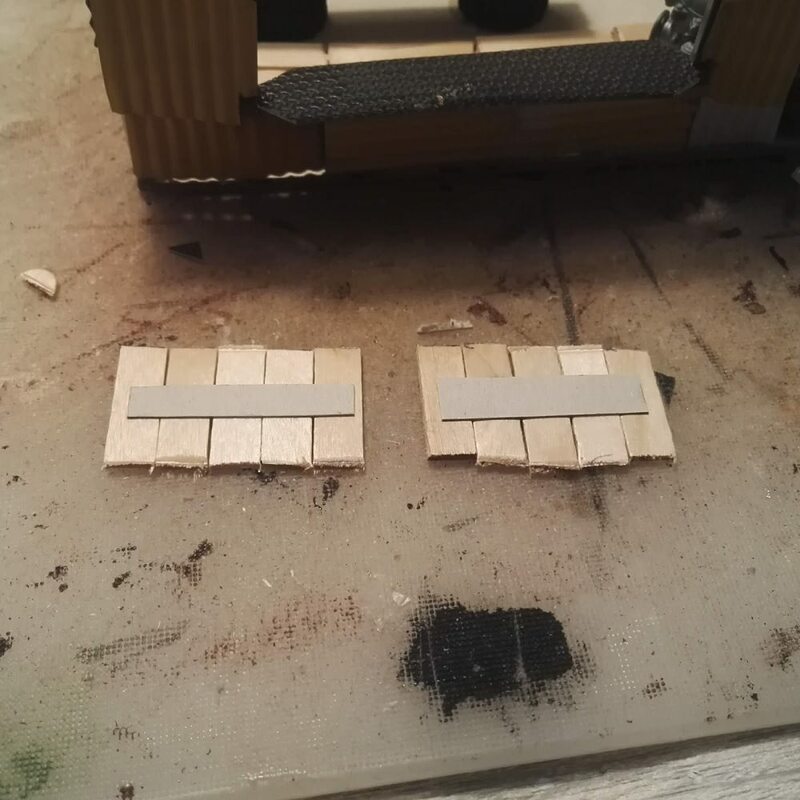 Make sure to secure both sides, glue doesn't bind will on metal. And this is a part that'll often get bumped into. 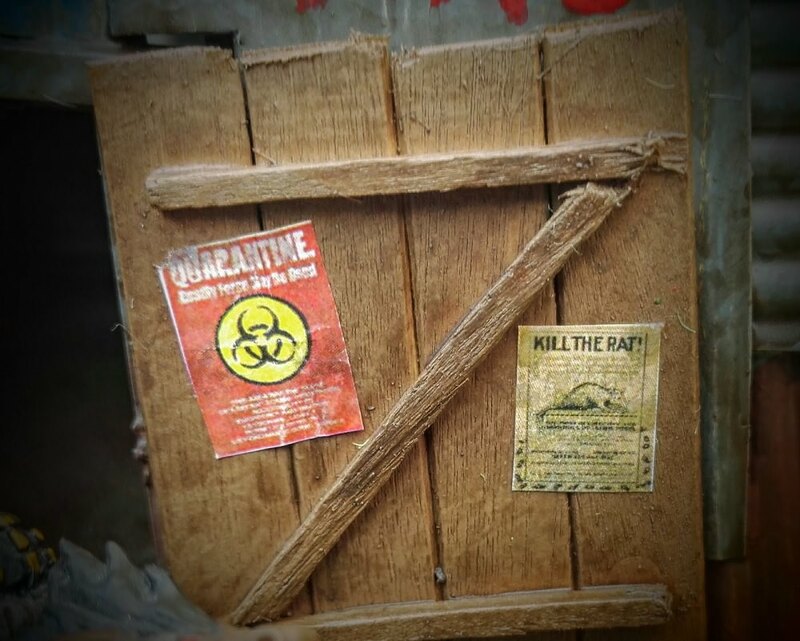 The cool resin sign is also from Ramshackle Games (and inspired the entire build). 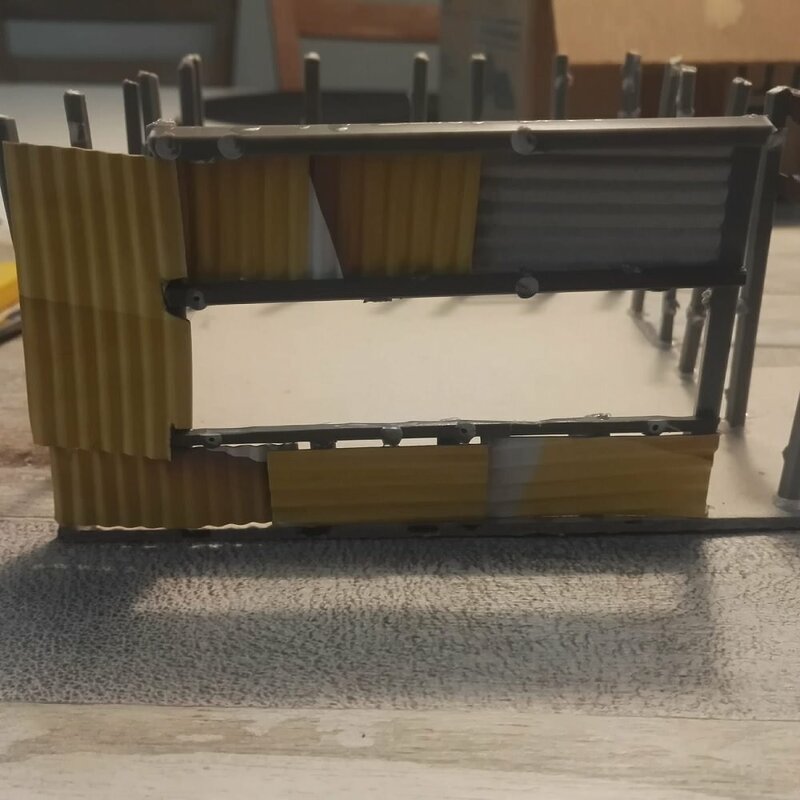 Also make a door for the bar, using matches and ice cream sticks. 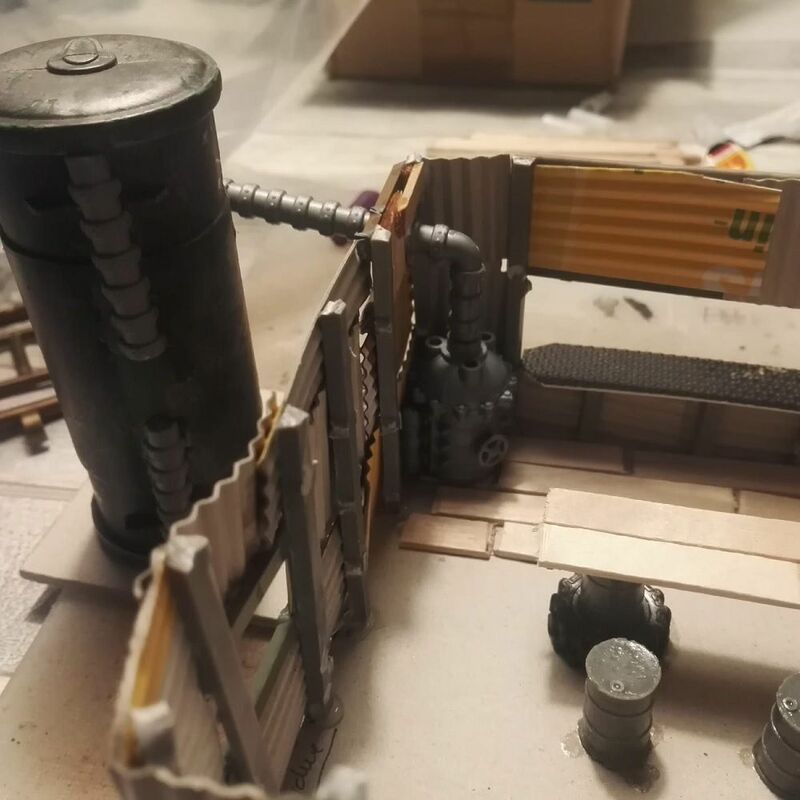 I added a few resin pieces to the terrace and the water tank. 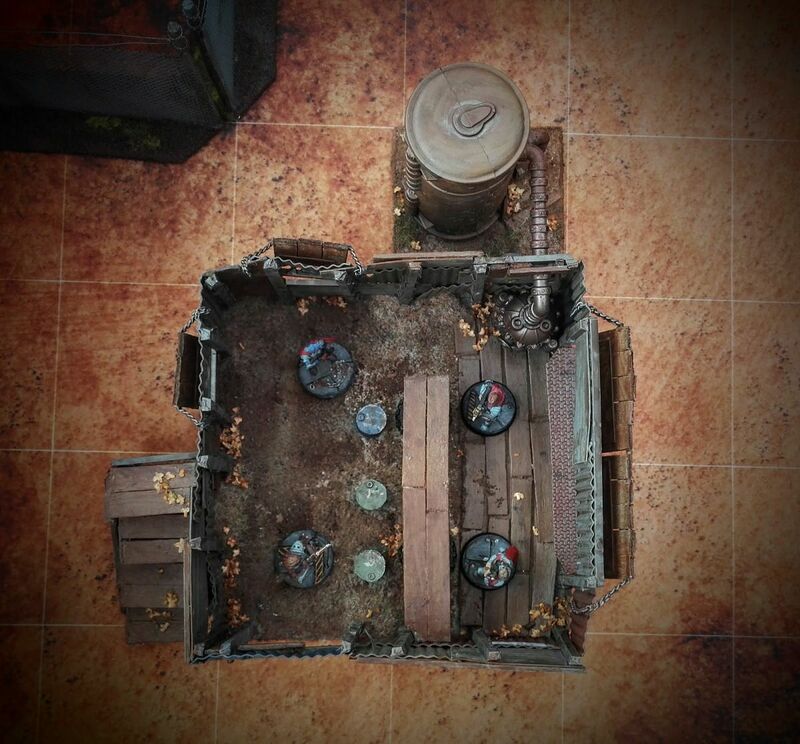 A few barrels and some crates. 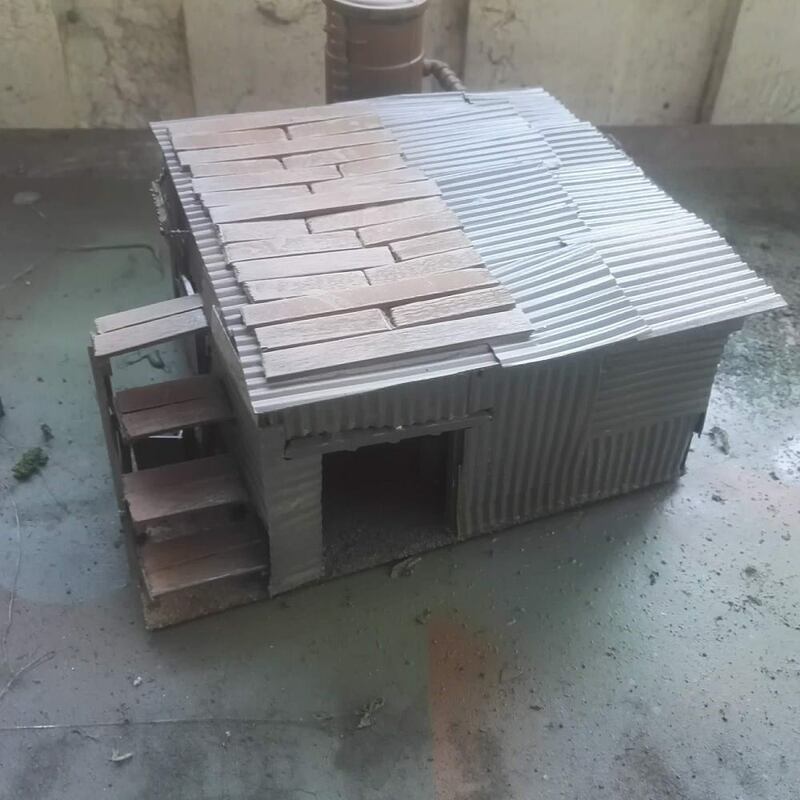 Using cheap spray paint, the entire build is base coated. All metal sheet areas are painted grey. The terrace and water tank is brown. Pick out a few metal sheets in muted colors and rusty brown. 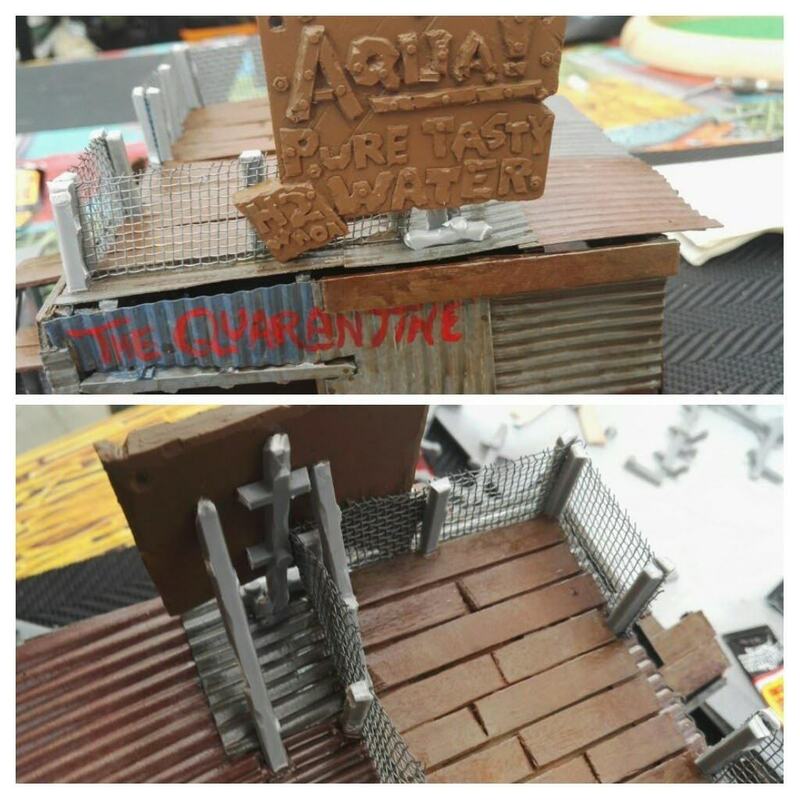 Give the entire build a heavy layer of Army Painter quick shade - you'll never finish the can anyway. Add grass tufts, static grass, leaves (dry birch tree seeds) and posters. 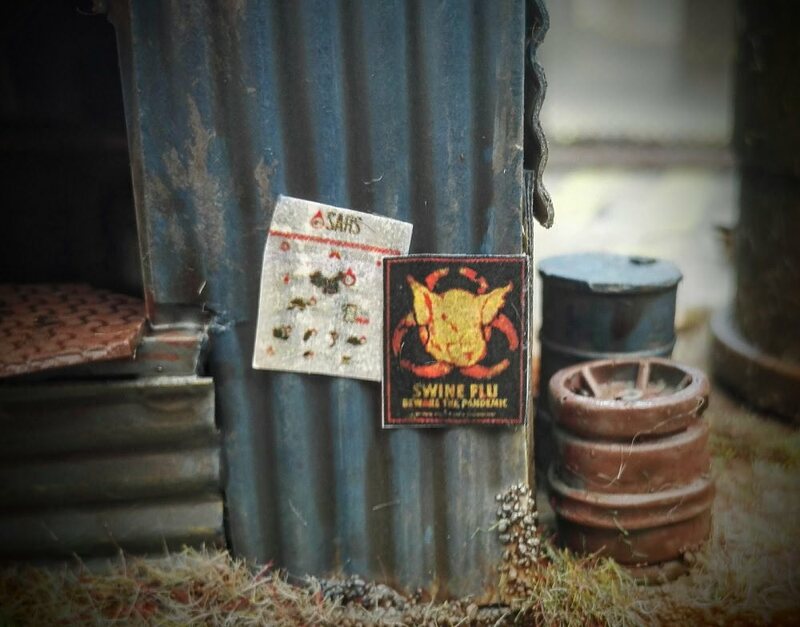 I went with biohazard themed ones from DriveThroughRPG. Then finish with some layers of matt varnish spray. It takes the shine of the quick shade and helps keeping the grass and leaves in place. Here's a bunch of photos, from the finished build. 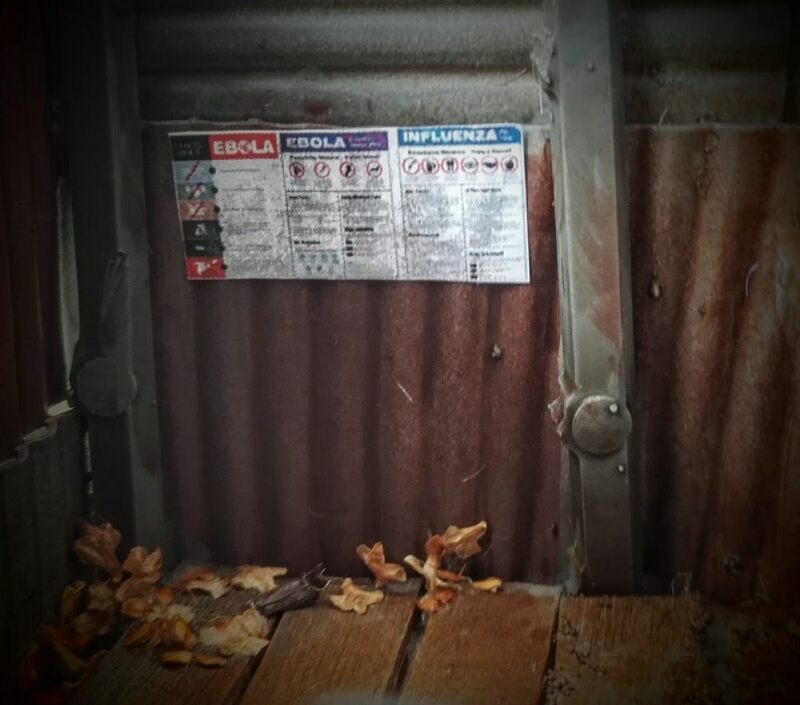 I named the bar the Quarantine and added posters with various diseases. 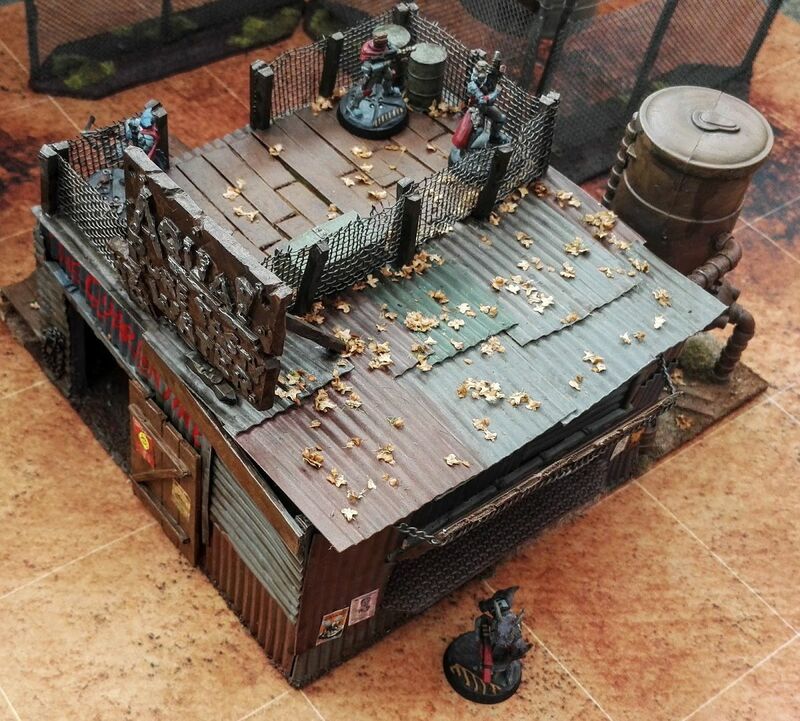 My 3' x 4' Wasteland setup is growing nice. 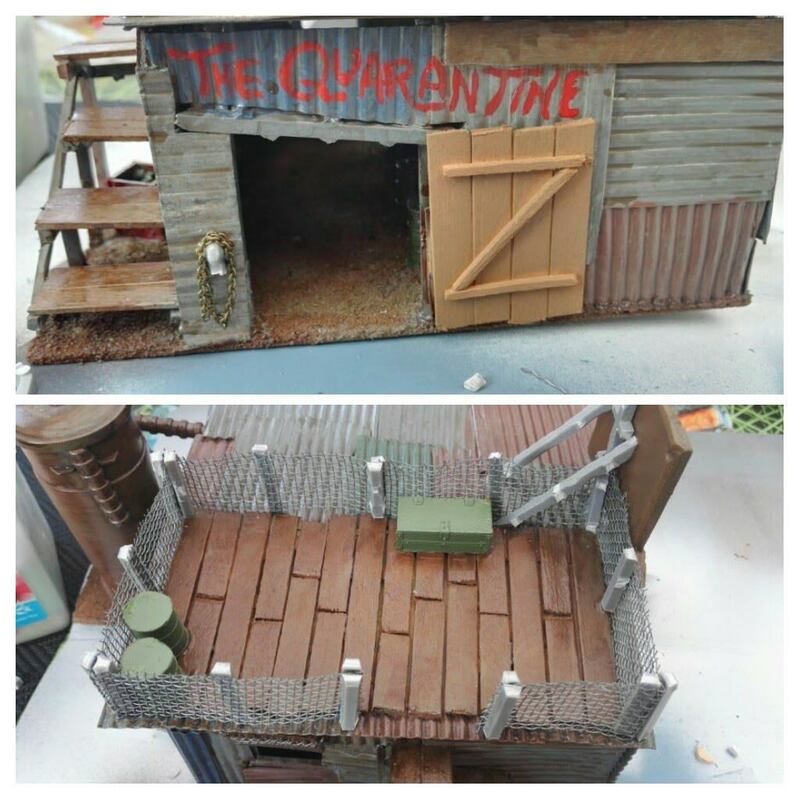 Check out tutorials for: Container, chain-link fence, tower, scrap walls and silos. Completely compatible with the Deadzone 3" cube system. That toothpaste squeezer tip is _excellent_! Thanks! That is an amazing piece of work. What are you using for dead leaves? Also, you say the toothpaste squeezer can do metal - do you mean just aluminum foil? Does it hold its shape well? Holy O' This stuff is awesome! I found your blog a while back and forgot the treasure it held. Good work Sir! 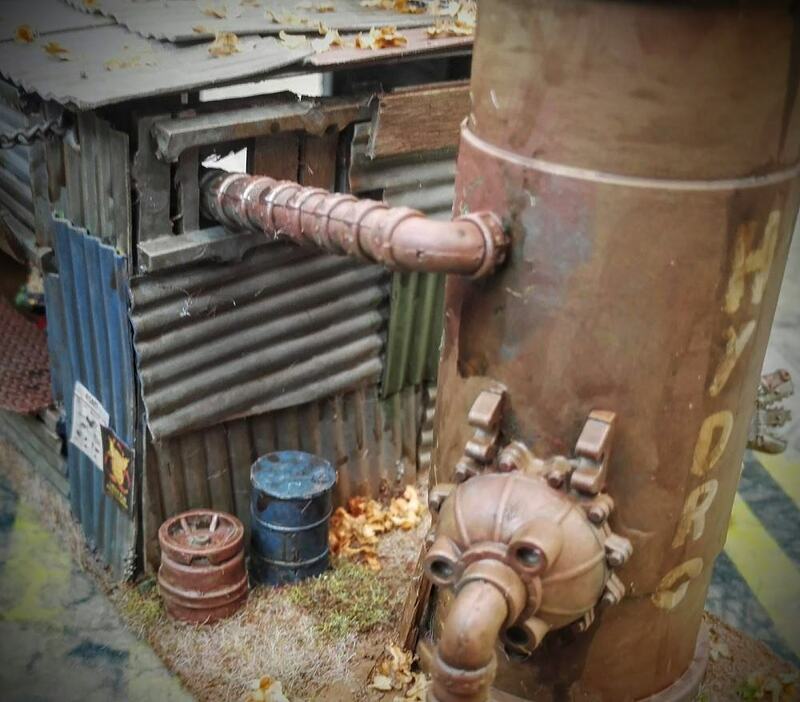 Amazing modelling! Isn't the cardboard too fragile though? OR does it get harder once painted/glossed over?